It wasn't just the U.S. markets that took a beating to end 2018... It was most of the world. Europe, Japan, and China all fell to end the year. And unlike the U.S., those markets had been falling for the majority of 2018... racking up double-digit losses for the year. Stocks around the world have rallied in January. But you'd be hard-pressed to find any global stock market hitting multi-month highs today... with one big exception. One market has been soaring since September, even in the face of global losses. And thanks to a rare situation, it could jump another 14% over the next year. I'll say up front that you probably won't like this idea. For many American investors, the idea of investing in certain foreign markets is a "no go." We hear from readers all the time telling us they can't bring themselves to invest in China. It doesn't matter how good the opportunity is – they aren't interested. This fear of investing in foreign markets has a name. It's called "home-country bias." I urge you not to succumb to it today... because we have an absolutely fantastic setup, right now, in Brazil. Brazilian stocks bottomed in September, and they have firmly reversed course since. The country is one of the only global markets making six-month highs right now. That alone is enough to get me interested. But Brazilian stocks also recently experienced a rare event... rallying for seven consecutive days. That doesn't happen often. But it tells us the trend is strengthening and the gains are likely to continue. Brazilian stocks have been booming, even before they climbed for seven straight days in December. They're hitting multi-month highs... And that's in the face of global weakness. Buying after similar instances led to 5% gains in six months, and a massive 14% gain over the next year. That's serious outperformance compared with Brazil's typical returns. Brazil is one of the few global markets to perform well recently. It's possible this rally is only temporary... But the trend is in our favor. And history tells us these gains should continue. 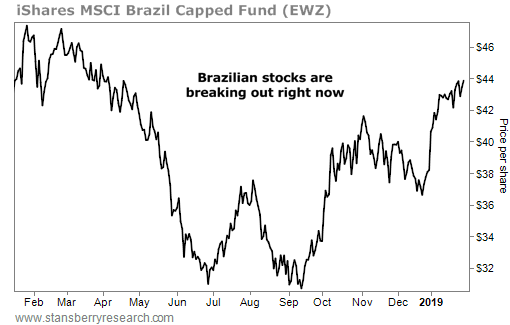 The simplest way to own Brazilian stocks is through the iShares MSCI Brazil Capped Fund (EWZ). This simple fund tracks the Brazilian market and allows you to easily take advantage of this opportunity. You might not like the idea of investing in Brazil. It might scare you a bit. But don't let home-country bias keep you out of a fantastic opportunity. "We have a simple recipe for making money in the markets," Brett writes. "Find something that's dirt-cheap... that no one else is interested in owning... and buy it once prices reverse." Get the details on another sector poised for big potential gains here: This Market Is Record-Cheap and Ready to Soar in 2019. Back in December, Steve shared how a decline outside the U.S. could set up a rare opportunity in the months ahead. Learn more here: This Group of Stocks Is a 'Top Buy' for 2019. 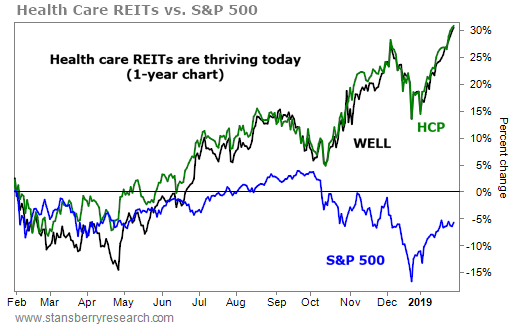 Welltower (WELL) and HCP (HCP) are two large real estate investments trusts (“REITs”). They both specialize in health care-related properties like senior housing, hospitals, and medical offices. As more people seek out medical services, demand for these properties will also increase. And this is great for investors… In 2017, these two companies returned more than $1.5 billion combined to shareholders through dividends and share buybacks.